Images have always had as much to do with the hand as with the eye. This photograph is elegant proof of image-making as an inherently physical, haptic act. Although, is this what we call an image? It’s not the result of someone holding her hand in front of a camera for an exposure. 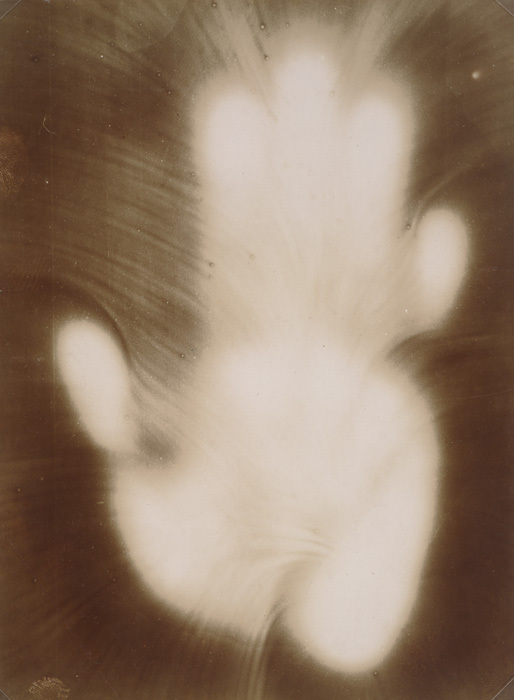 “Digital effluvia” comes from pressing — the hand of the attributed photographer’s relative, in this case — into the toxic gelatin silver of the wet negative paper or plate. “Effluvia” meaning an invisible emanation, a lightless image made rather than captured, a by-product of a process meant to produce a different photographic output. And “digital” meaning fingers and thumb. In his effort to debunk psychics, Houdini likely testified before Congress against digital effluvia. Images made by this means were sometimes called “spirit photographs,” used by spiritualists as faux-scientific evidence of both the existence of ghosts and a medium’s ability to communicate with them. Certainly there’s an other-sideness about Miss Majewski’s handprint, recalling an embryonic hand pressed into a third-trimester belly. Not so much a gesture from the afterlife as a gesture from before life, a negative number of digits. A reaching out either to request that we pull her through to our side or to warn us to go away. Waxing aside, this is a handprint in photosensitive goo, made in darkness and then developed — an image of a process as much as a human form, both of which come together in gesture, from which every image originates. With hairy fingers and thumbs, early humans foraged minerals and harvested bone marrow to smear scenic petroglyphs onto cave walls. Painters ground pigment, blended oils, and wielded brushes between deft fingertips to produce Renaissance masterpieces. Abraham Zapruder’s sweaty finger jammed down upon the trigger of his spring-driven Bell and Howell 8mm in Dealey Plaza. Cindy Sherman brushed her palms over the shoulders of garments on thrift store racks, feeling the textures of weaves and seams in choosing costumes for her film stills. Even digital photography requires the pushing of a button, the connecting of a USB cable, the downloading, clicking and dragging, cropping and posting. “Digital,” here, meaning binary data that reduces outliers and variance, the effluvial bits of an electronic non-eye. “Digit” and “diction” share a Greek root meaning “to show.” The simplest language act of ostension, or pointing at the referent of an uttered word, conflates finger and eye. Seeing might be nothing more than touching extended out the end of the arm and hand. The look is a grasp. Touch may, in this, be our only sense. In a late essay entitled “Right in the Eyes,” which deals with photographs and anxiety, Roland Barthes identified three ways that science theorizes looking, or “the gaze.” One of them is “in terms of possession (by the gaze, I touch, I attain, I seize, I am seized. )” But when gazing upon a photograph, it gets messy. It is really our gaze? A photograph presumably images its photographer’s gaze. We’re displacing his or her vantage. And what exactly are we gazing at? The photograph is different from its subject, as different as pointing is from what’s pointed at. Miss Majewski’s hand makes matters even messier. This is an image that’s not of anything. It just is. We’re gazing at the pointing finger like a pet does. This photograph takes on the spiritualist sense of Barthes’s “possession.” By looking upon this evidence of an event, we are inhabited by it. Its negative capability animates our own hands. Miss Majewski’s invisible hand radiates vital energy. She was there. We don’t need her image. We are touching each other. When we finally ruin the Earth, and our eyes dry up, we will feel our way. Chris Vitiello is a freelance writer, teacher, and poet based in Durham, N.C. He writes about performance, books, hockey, and the visual arts, earning a 2011 AltWeekly Award nomination for arts criticism. His books of poetry include Nouns Swarm a Verb (Xurban, 1999), Irresponsibility (Ahsahta, 2008), and the forthcoming Obedience (Ahsahta, 2012).